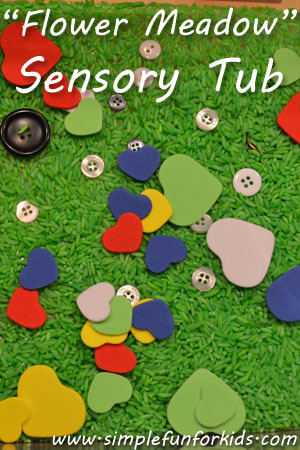 What we used: We revisited this sensory tub several times, and I added something new each time. 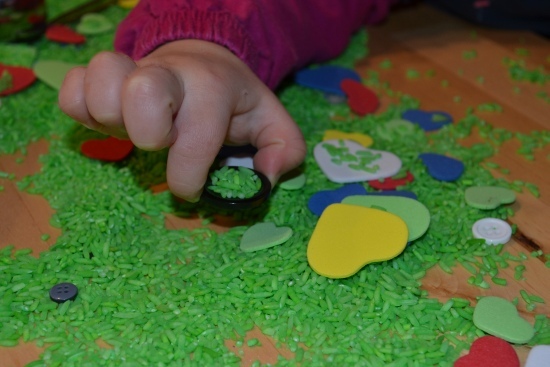 To start with, I used green dyed rice as a base to make up the “grass”. 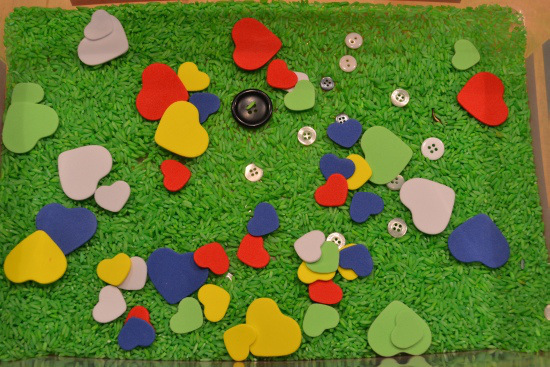 I added a bunch of buttons I’d been saving up, and a bag of heart-shaped foam cut-outs. This was slightly different from what I’d been planning but I ended up setting it up at a moment’s notice when E saw the green rice drying in the kitchen and wanted to play with it RIGHT NOW 😉 (I was going to add felt flowers and other flower-shaped things but didn’t have them yet.) She brought her own choice of tools along when she saw me put up this tub. 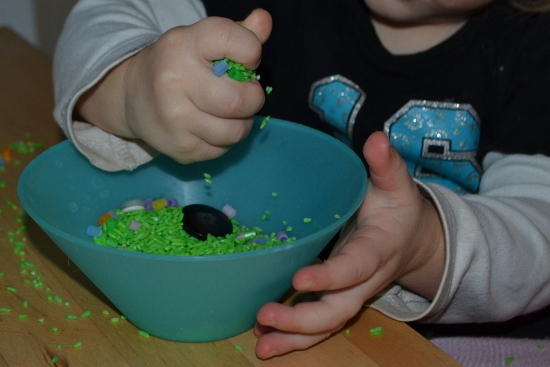 When E asked for the tub for the second time, I added a cup of beads in pastel colors. And for the third round with the tub, I put in a few real flowers from a broken twig on my Mother’s Day orchid. 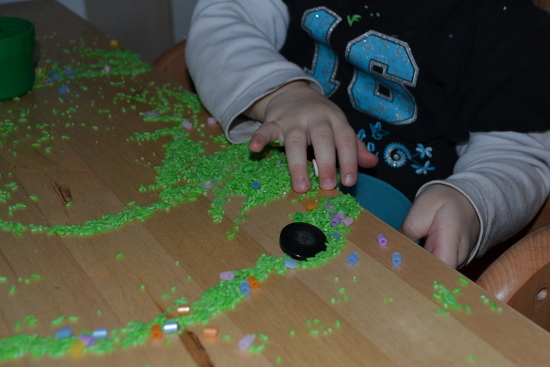 E really enjoyed this sensory activity. She’d never asked for a specific activity three times in a row before. 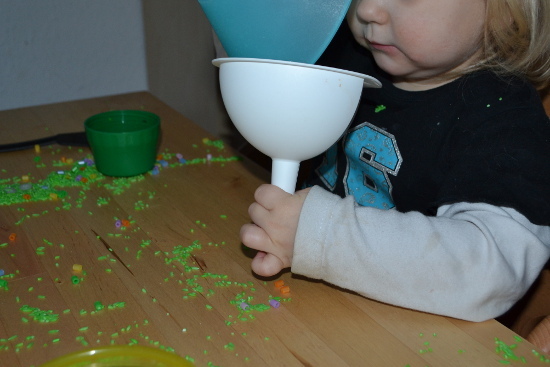 She liked the colorful and so different materials, and the funnel that she used for the first time. The hearts kept getting stuck in it but she still kept trying. Truth be told, she wasn’t actually that much into the real flowers – maybe she was simply more attracted to the colorful stuff. 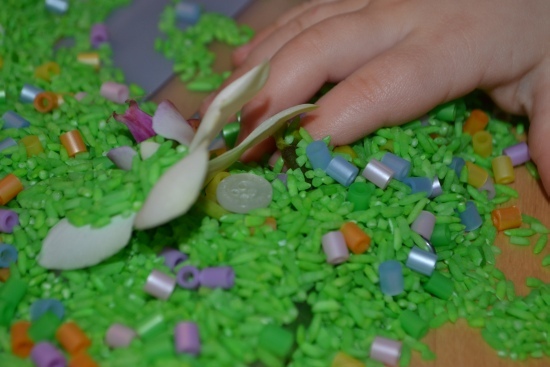 Edit: Click here to find out what became of our “Flower Meadow” Sensory Tub when there wasn’t enough left to keep it in a tub. What I learned: Colorful simplicity can work just as well as more elaborate set ups that I might’ve had in mind originally. 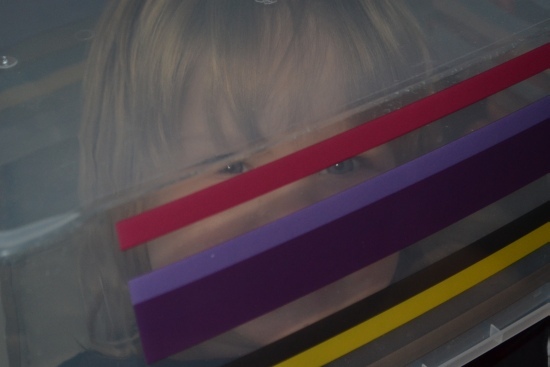 Additional suggestions: As with all sensory tubs, you can use what I did, be inspired by my materials, or do it completely differently – it’s all about the varied sensory experience that your child doesn’t get every day, whether it’s following a theme or not, and it can come from a wide variety of materials. The idea: The image just popped into my head one day – much like the first photo above (although it might have been a bit more elaborate at first 😉 ). I would’ve loved to do it with real flowers from outside (and real grass!) but we were a bit short on those in the middle of winter. The “real” Flower Meadow is definitely on my to-do list for this spring, though. How have you created a hint of spring in the middle of winter? Tell me about it in the comments!